Better nutrition. Better health. Stronger communities. 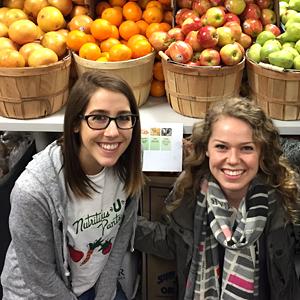 The Public Health Nutrition MPH program is designed for students who are committed to health promotion and disease prevention through healthy eating. The curriculum strongly emphasizes food access, nutrition policy, community nutrition interventions/programs, health disparities, nutrition assessment, and healthy eating throughout the life course. Our unique infrastructure combines Public Health Nutrition, Maternal & Child Health, Community Health, and Epidemiology in one department, giving students access to faculty across disciplines. Career and Impact Focused. Thorough, application-oriented training develops the skills necessary to create, implement, and evaluate nutrition programs and interventions. Innovative Education. Students can focus their training on epidemiologic methods, pursue the coordinated master’s program—one of the only programs of its kind in the U.S., or customize their studies to other specialty areas. Tailored Focus. Through concentrations, certificates, and minors such as global health, public health policy, and health equity, students can tailor the program to their interests. Exposure. Students move through the program with one cohort group and engage with faculty, practitioners, and trainees from various backgrounds in a highly interdisciplinary environment. Students with career goals in public health and applied nutrition, community intervention, and nutritional epidemiology are ideal candidates for this program. The program is also a valuable prelude to other graduate and professional education, including education in applied health professions (such as medicine, nursing, or dentistry), law school, and agriculture-focused studies. Click here to learn more about the program and program requirements, including graduation requirements. 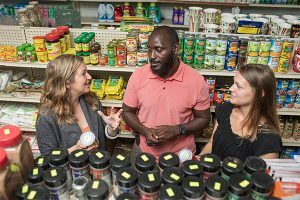 Professor Melissa Laska (left) and Public Health Nutrition student Kirsten Arm (right) are working with local Northside business owners, like Ousman Camara (center), to get healthy, fresh food in neighborhood stores.